Man, I ate too much! These are words you often hear during the days after a holiday we celebrate called "THANKSGIVING!" We celebrate this holiday every year and take time to thank God for a good harvest and for having enough to eat and for all the other blessings we have. We celebrate this holiday after harvest time - after all of our crops are in. But not everyone has enough to eat. There are people today who are hungry, and we try to find ways to help them get food to eat. There are good people who look out for others, and we admire these people. This was true way back in the times of the Old Testament also. 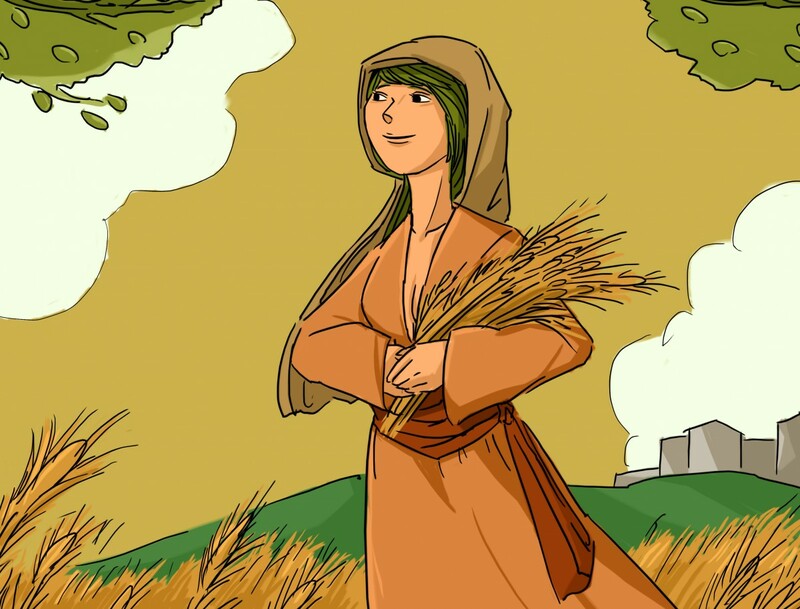 In fact, one of the most famous stories in the Bible is about a woman trying to get enough to eat at harvest time and the good things that happened to her because she tried to help another person in her family. Biblical scholars say the story was written by the Prophet Samuel. In Israel, there is a large city called Jerusalem. It housed the Temple where people came from all over Israel to pray. The city was filled with large numbers of people and many businesses. As big and noisy as Jerusalem was - that's how small a tiny town about five miles southwest of Jerusalem was. The town was a farming community - a place where grain grew well and where people grew and harvested grain to live. That small town rarely had more than a few hundred people living in it, including the shepherds who watched over flocks outside of town on the hillsides. This was the town where Naomi lived with her husband, Elimelech. This was the town of Bethlehem. We don't know much about Naomi and her husband other than they left Bethlehem when a great famine came over the land. The moved to the land of the Moabites - a land of strangers - a land where Jews and Moabites usually did NOT get along. But - it was a land where there was water. The wells were good and crops could be watered, and families could raise enough grain to eat and sell to make a living. Naomi and Elimenech had two sons who grew to manhood and who took Moabite women for their wives. One of the sons married a kind hearted woman by the name of Ruth. The other son married a woman named Orpah. This story could end with a happily-ever-after here. I could tell you that they all had enough to eat and they were happy and that they grew old together, but that?s not what happened. Elimenech died and left Naomi widow. Without a husband to take care of her, she would have to depend on her two sons to help her. And this is what she did for almost ten years. But - the sons died also! Now Naomi and both of her sons' wives had no one to work and feed them. Jewish law let men own property, but the women without a man to share the property with them would be homeless. This is when Naomi decided to move back to Bethlehem. The famine was over, and maybe she could find enough food to eat. She told both girls to stay in the land where they had grown up and to not feel obligated to come with her. "You have been good wives to my sons, and you have been good to me," she told them. Orpah hugged Naomi and Ruth and cried with them - but left to go back to her people. But - Ruth showed she was a caring and loving person. The name Ruth means faithful and caring person. Ruth stayed with Naomi. "Go with your sister-in-law. It?s okay," said Naomi. "Go back to your own people. ."
"Don't tell me to go or not to follow you," said Ruth, "Wherever you go, I will go. "Wherever you will live, I will live. Your people will be my people." "Your God will be my God. And where you die and are buried, I will die and be buried." And so it was that the two women returned to Bethlehem. They returned right at the time of the harvest. It was almost this time of year. The barley was ripe in the fields and ready to be cut. The olives were ripe in the trees and ready to be picked. It was a time when a poor person could get food to eat if they were willing to work. The Jewish law allowed poor people to go into the fields that were harvested to get food that was left over by the harvesters. The law said that if you dropped a seed or a stalk of grain with lots of kernels of grain on the ground, it had to be left there for the poor to find it and eat it. This was called gleaning, Hungry workers went into the fields and followed the harvesters - hoping grain might get spilled or knocked over on the ground. Naomi heard that a member of her husband's family named Boaz was harvesting crops with his men. "Go into Boaz's field, said Naomi, for he is a good man. You will be safe in his fields." This was how Ruth met Boaz and how Boaz met Ruth. Ruth worked harder than the other women since she had to gather food to feed two people. Boaz noticed her and liked the way she looked and the way she worked and asked his workers about her. This made Boaz happy to hear that she was so caring to one of his relatives, and he went to Ruth. "Stay in my fields, he told her. My men have been ordered not to bother you, and when you get thirsty - feel free to drink from the jars of water that are available for my men to drink." "Why do you help me? I am a stranger in your land?" asked Naomi. "I have heard about how you have taken care of your Mother-in-law," said Boaz. "You left your own family to come here among strangers to help her. You are acting godly, and God will bless you for the caring way you act." Then Boaz told his men in secret to watch wherever Ruth harvested. They were to drop extra stalks of grain on the ground for Ruth to pick up. "Uh-Hmm!" said Naomi," when Ruth told her about what had happened. "Blessed are men who follow the way of the Lord. That man is a good man, and that man likes you. And because he is related to my husband, he is able to help you get back our land. Tonight - here's what you do," and she had a talk with Ruth. Ruth bathed and washed up extra well to get the sweat from her day's work off her body. She anointed herself with nice smelling perfume. She put on a nice outfit. Then she went to where Boaz and the men were partying. The men ate and drank to celebrate the harvest - a man-type of Thanksgiving. Then - after partying into the dark, they laid down on the threshing room floor to sleep. Custom was to sleep with their heads towards the center of the room where the grain was piled up high and their feet facing out like the spokes on a wheel. With swords by their sides, the men would be ready to rise up if any enemy tried to steal their harvest. But, Ruth was not an enemy. She kept out of sight until the men were asleep then went to where Boaz lay. She lifted up his cover and laid down beside him near his feet. Of course, Boaz woke up. "Who are you? And what do you want?" asked Boaz in the dark. I am Ruth, the daughter-in-law of Naomi," answered Ruth. Spread your cover over me, your handmaiden. Protect and care for me." This meant - take me as your wife and help me get back my family's property. Now that the harvest was done, she and Naomi would have no more food. "You are truly a good woman, Ruth," he said. You could have gone to someone younger - or someone with more money and offered to marry them, but you came to me. I'd like to help you, but there is someone else who has the first right to marry you and take your land according to the law. Stay with me tonight, and in the morning I will go to him. If he will not marry you, I will. Ruth did stay the night to be close to Boaz - but left in the morning before anyone else got up so she would not hurt his or her reputations. Boaz asked some of the elders to serve as witnesses to show he was following the law. He found Naomi's closest relative and told him that he could inherit her son's land - but only if he took Ruth for a wife. Getting the land would be great - but taking a wife he didn't even know was too much, and the man turned down the chance to inherit the land. So Boaz took Ruth for his wife. The two cared for Naomi for all of her days and lived a life filled with love and happiness. Of course part of that love produced a little baby in Bethlehem - a son by the name of Obed. And Obed was the father of Jesse. And Jesse was the father of David, the same David who slew Goliath and became King of Israel. The same David from whose family many years came the birth of another baby in Bethlehem, a child called Christ, the Lord.